Everyday things can be scary if your puppy has never seen them before. There is a ‘sensitive period’ for every puppy, between 8–16 weeks of age. During this time, they learn to accept things around them as normal with nothing to worry about. This period is the best time to help your new puppy socialize with other dogs, animals and people, and start learning basic training. Try to expose your puppy to as many different situations and individuals as possible during this period. Later, your puppy may find it more difficult to cope with unknown situations. Create lots of opportunities to expose your puppy to new people, places and things. Limit the number of new things at one time. Repeat often! Make all encounters enjoyable. Reward quiet reaction to each new exposure with treats and a warm voice. Introduce new objects at a distance. Give strangers (e.g. friends coming to visit you at home) tasty treats and a toy so they can interact with your puppy around food and play. If your puppy seems anxious, give more space and freedom to approach in their own time. Distract them with a toy. Common signs that your puppy feels uncomfortable include ears back, cowering, tucked in tail, licking lips, yawning. Signs that your puppy feels okay are a relaxed tail and face or a playful posture. Read our tips to become an expert in reading your puppy's body language. Using ADAPTIL Collars during this critical stage of life helps your puppy keep positive during these encounters. It has been proven to help puppies learn better and quicker, and develop into balanced adult dogs. Puppy classes are a great way to encourage your puppy to learn and develop into a confident, outgoing dog in all circumstances. Puppy schools are designed for pups 8 to 16 weeks old. 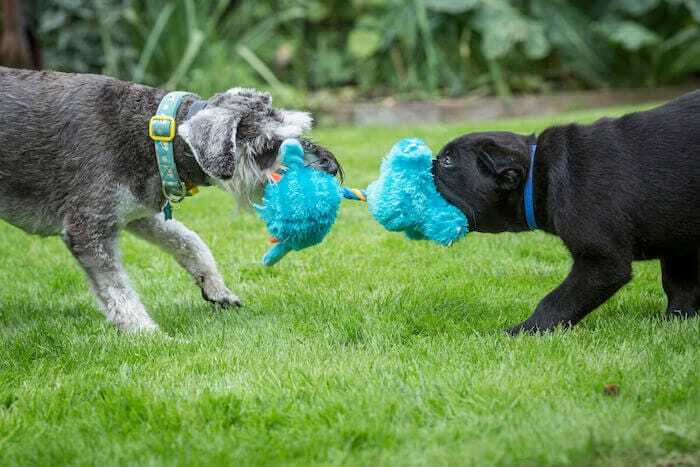 They are a fun way to bond with your puppy during their most important developmental period.